Mihai Șubă (Romanian pronunciation: , born June 1, 1947 in Bucharest, Romania) is a Romanian chess Grandmaster. FIDE awarded him the International Master title in 1975 and the International Grandmaster title in 1978. He won the Romanian Chess Championship in 1980, 1981 and 1985. He first came to wide attention in 1982 when he finished second, after Zoltán Ribli, at Băile Herculane. At the 1982 Las Palmas Interzonal he finished third, behind Ribli and former World Champion Vasily Smyslov, just missing qualification for the Candidates Matches. Șubă finished first at Dortmund 1983, and equal first at Prague 1985 and Timişoara 1987. In August 1988, he sought political asylum in Britain, and he played for England at the 1989 European Team Chess Championship, though he started playing for Romania again in 1992. As of May 2012, his FIDE rating is 2423. His peak rating was in 1983 with the 30th position in World ranking. 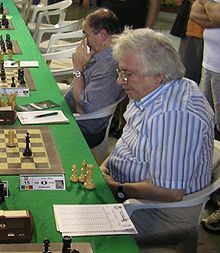 Controversy erupted at the 2008 World Senior Chess Championship when Larry Kaufman was named the winner on tiebreakers ahead of Șubă in second place. The tie-breaking system used, erroneously interpreted as mandatory by FIDE, did not match the one published by the organizer, which was the valid one according to newer regulations and had the strength of a contract. Subsequently, Șubă and Kaufman were retroactively declared joint winners of the championship at a FIDE Presidential Board meeting in March 2009 (with Kaufman keeping his resultant promotion to Grandmaster).